Like with any new business, work at Greenstreet is complete fly-by-the-seat-of-your-pants. Tasks for me range from doing dishes from the last night’s cupping to helping out with reports and marketing projects. Chris and Tom always run in and out of the shop for a delivery or a meeting. The roaster is going and when the coffee pours out, it’s makes the sound of a bright steel wind chime. Chris and Tom are constantly letting me try out new coffees. I am often on a caffeine-high by the time I leave. To introduce myself, I’m Irene Shin: born and raised in Charlotte, NC and now in my senior year as a philosophy major at Bryn Mawr College. When I first got to college, I was introduced to a lot of schoolwork, extracurricular activities, and inevitably, coffee drinking. Soon enough, My interest in the beverage became more about the taste than its caffeine content, and I and went into exploring different flavor profiles, roasts, and soon enough, the actual industry itself. I looked around the Philadelphia area for first hand experience and got myself hanging out with the Molieri crew. If there’s anything I’ve learned while at Greenstreet, it’s that I should never take for granted the amount of work behind my morning cup of coffee. The exchange of hands it takes to get coffee to the American household is startling. The industry is comparable to oil in its size and politics. The coffee industry even tried to make its own equivalent to OPEC (unlike OPEC, it failed). Like any other commodity chain, nothing about coffee is simple; but there is also absolutely nothing else out there like coffee. The preceding sentence is not an opinion; it is a fact. Coffee is synonymous with the workplace and productivity while also engendering the reputation of leisure, comfort, high and low brow tastes. There is not one but hundreds of different coffee cultures in the world. The development of a middle class in a country like India directly correlates with an increased demand in the coffee supply. You take a whole afternoon drinking coffee in Ethiopia. 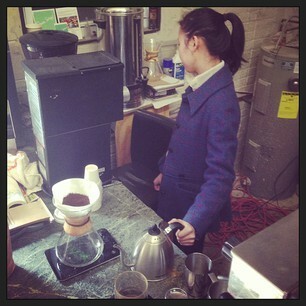 Try even thinking about having a happy workplace without a drip pot in the kitchen pantry. Then you got those roasters who got people like me buying their stuff hook, line, and sinker. The ones who try to sell you culture, leisure, solidarity, and ethical practices all in a brown, twelve-ounce bag of coffee. The people who toot about direct trade and helping out the growers who need it the most. Your coffee tastes great, and you can feel great about it. What is direct trade anyway? Is it different from fair trade? The bottom line difference is simple: Fair Trade is a certification that ensures that a coffee abides by particular labor and wage guidelines; direct trade is when roasters purchase directly from coffee growers (but not really). There is no simple answer to which is better. Fair trade only works with coffee cooperatives and require about $1.25/lbs is paid back to the cooperative—the price is $1.60 if the coffee is both certified organic and fair trade. Several other labor requirements are required like no child labor as well. Fair Trade is an increasingly popular certification and has gained an impressive amount of clout. Direct Trade, by nature, doesn’t have any guidelines since its prizes in direct communications with the growers. Roasters involved with direct trade often give more than Fair Trade’s required minimum, and roasters can often help producers improve their product since roasters know exactly what they’re looking for. Direct trade is being advertised as the new wave of commerce practice, and it’s starting to make roasters like household names. But again, coffee is complicated. Roasters who toot direct trade can’t be kept to their word because there’s no third party oversight, and the transparency reports they provide online are lackluster marketing ploys (to be honest, same goes for fair trade). By only working with cooperatives, fair trade have contracts that say that 30 cents go to the growers, but where the heck does the rest of the money go? Environmental sustainability is also a touchy subject. Your may be USDA Organic, but in the end, coffee, like all products, is shipped across the globe on huge ships on a daily basis.